wp_admin has been a member since May 26th 2013, and has created 10 posts from scratch. Durango is one of the 31 states which, with the Federal District, compose the 32 Federal Entities of Mexico. The state is located in Northwest Mexico. Having a population of just 1.7 million inhabitants making it Mexico’s second-lowest population density, after Baja California Sur. 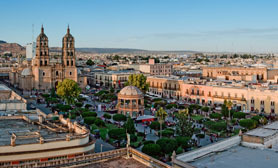 Victoria de Durango City is the state’s capital, named after the first president of Mexico, Guadalupe Victoria who served from March 31, 1823 until October 10, 1824. Durango is just one of over 60 official online guides covering the whole of Mexico. If you´re planning a trip to Mexico and would like discover our fabulous nation before visiting or, if you´d like to visit a specific place in Mexico, then you´ve come to the right place. Durango is Mexico’s fourth largest state and is bordered to the north by Chihuahua, to the north-east by Coahuila, to the south-east by Zacatecas, to the south-west by Nayarit, and in the west by Sinaloa. Therefore, similar to its neighbor state Chihuahua, Durango is one of Mexico’s numerous landlocked states. 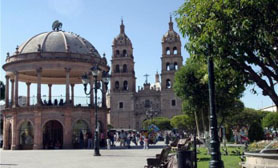 Durango is one of Mexico´s most popular places, visited by millions of people over the last decade. When you travel to Durango you may wish to check out the Durango hotels we have available or maybe you´d like to rent a car in Durango? We also offer extensive day trips in Durango. This unique place has simply amazing. We´ve also compiled a list of Travel books on Durango Mexico. The states average elevation is of almost 2,000 meters (6,600 ft), most of the state is heavily mountainous and a good part forested; the Sierra Madre Occidental, shared with the state of Chihuahua, occupies two thirds of the state, mostly in the western and central part of the state. 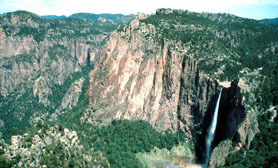 In the western parts of the Sierra Madre, Durango’s geography is characterized by deep ravines and rivers that flow mostly westward. The highest point in the state is Cerro Gordo at 3,340 m (10,960 ft) above sea level. The Cerro Gordo mountain range contains a good supply of minerals, including the silver that encouraged Spanish occupation of the territory after it was discovered. These mines extend north into Chihuahua and south into the state of Zacatecas. Vast desert basins in the Laguna District are fed by the 560 kilometers (350 mi) long Nazas River. Whether you are visiting Durango in Mexico for business, pleasure or both, we´re sure that Durango will meet all of your expectations and that the people of Durango will make you feel welcome while sampling some of the unique cuisine on offer in the Durango Restaurant districts. Posted in About Durango Mexico | Comments Off on Welcome to Durango in Mexico! Durango is known by most Mexicans and internationally for two reasons: one being that it is “the land of the scorpions” due to the many species of scorpions in the state, especially in the colonial areas, and second as “the land of cinema.” Over 140 film productions have taken place in Durango, both domestic and foreign, and subsequently, during the decades of the 1950s, 60s, 70s and 80s, had earned that title. Durango has become one of the favorite places of film directors and producers due to its striking views and scenic attractiveness. 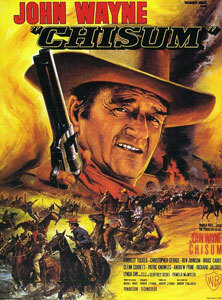 Film arrived in a train heading to Durango in 1889; when the Mexican Revolution began in 1910, film producer Raoul Walsh recorded the battles of General Francisco Villa. These scenes were included in the film The Life of General Villa produced by D. W. Griffith, and directed by Christy Cabanne in 1914. 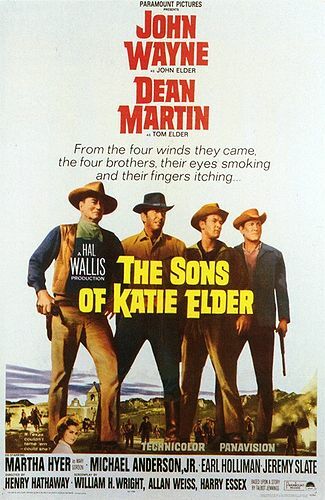 The notoriety of these movies allowed Hollywood to discover Durango in the middle of the 20th century. The movie industry officially entered the state in 1954 when American film art director Jack Smith flew over Durango and was instantly in awe of the landscape. 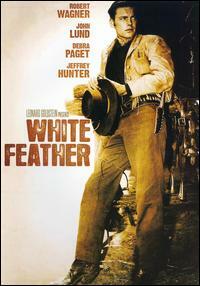 Consequently, the first movie filmed in Durango was White Feather, directed by Robert D. Webb. among numerous others without the presence of Wayne. 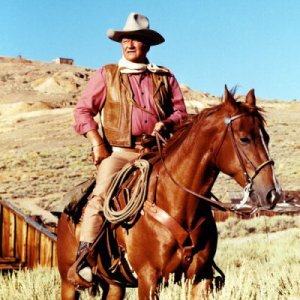 Due to the amount of time that John Wayne was filming in Durango, that he bought a ranch in the state which he visited and stayed at frequently throughout his life. Durango’s cinematic past remains an important part of the city’s history, with more than 100 movies filmed there. 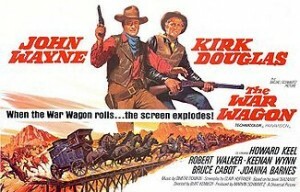 The first production shot in Durango “White Feather,” released in 1955 and starring Robert Wagner; later films included Western classics such as “The Magnificent Seven,” “The Wild Bunch” and “True Grit.” At Chupaderos, you can still visit the movie sets, and the Museo del Cine in Durango provides further exhibits featuring the old sets, as well as cameras and other film-making equipment used in the 50´s along with some outtakes and other curiosities of the era. You´ll not find clearer night skies than those in El Salto City, in Durango. 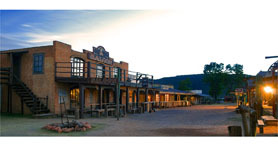 Its notoriety as the perfect setting for any Hollywood Western is well known, as well as its open skies in the desert with simmering moonlight strewn from the yellow sands. 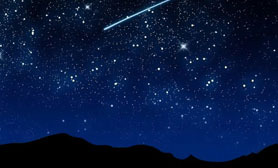 In the city of El Salto there are places such as Puentecillas where, along with the fresh air, you will be able to admire astronomy, without having to use special telescopes, the starriest nights and even see the Milky Way. 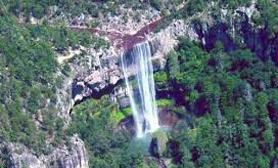 The city of El Salto is nestled in the Sierra Madre Occidental which range extends from near the Arizona border down to the Sierra Madre del Sur. 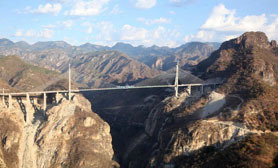 The high plateau that is formed by the range is cut by deep river valleys. This plateau is formed from volcanic rock overlying a basement of metamorphic rock.and is one of the busiest industrial logging places in the country. The scenery is covered with pines, lakes and waterfalls, and is perfect for hiking, ecotourism and amazing outdoor adventures, in addition to more exciting activities such as white water rafting, rappelling, rock climbing and zip lining. 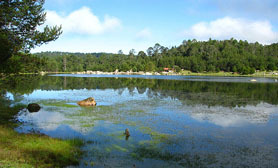 El Salto is promoted by the state’s tourism office as the perfect location for camping, having a great picnic or living outdoors while on vacation in one of the numerous family cabins available for rent. Spanish Basque region conquerors that founded Durango and began the conquest of the northern territory brought their local recipes and the first herds of animals. 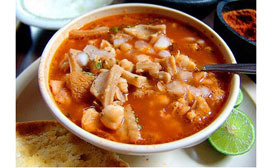 Among the famous dishes from Durango, is “caldillo”, particularly recognized for its antiquity but still a local favorite. 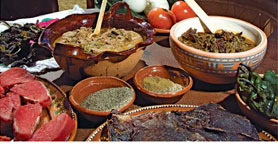 Along with beef it can be prepared with green chile (chile verde), red chile (locally called chile Colorado), or dehydrated green chiles (called locally chile pasado). The stewed broth is the first culinary preparation in the long history of culture in Durango, and demonstrates the influence of cultures that have been in the origins of Durango. Its source goes back to the days of the Basque Military Captain Francisco de Ibarra; one of the first conceptions appears in an old manuscript that belonged to Joseph del Campo Soberón and Larrea Soberon, the Count of Súchil Valley who were wealthy miners and landowners in Durango. 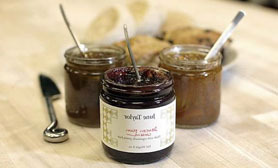 Durango is also famous for its Jams (marmalades) and fruit preserves made from quince, figs, and peaches, as well as the native pitahaya with the use of cane sugar to make jam and jelly can be traced back to the 16th. Gallina Borracha or ‘drunken chicken’ is a dish exclusively from Durango, made mostly of ingredients of Spanish origin, such as raisins, sherry and almonds. 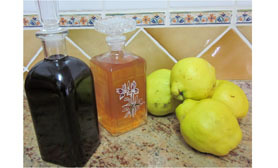 Traditional drinks include Licor de Membrillo, a liquor made from the quince fruit. 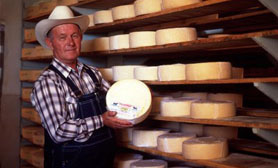 Durango is also for its cheese, in particular queso chihuahua, also called ‘queso menonita’, a type of cheese made by the state’s many Mennonite residents as well as the traditional “Queso Ranchero” usually made in the high mountains called “Sierra’s” of Durango which tourists as well as native’s eat with equal frequency. Another dish unique to Durango is called “Venorio” made using pork ribs cut into small pieces, cactus and a unique chile sauce made with diverse ground seeds of pumpkin as well as chile seeds, which gives a characteristic orange look to the sauce. Another local favorite in Durango is beef jerky (known locally as Carne seca) a traditional food that can be used to make “machaca con huevo” (jerky with eggs) and caldillo con papas (jerky and potato soup). Residents of Durango also enjoy other traditional Mexican dishes, such as tamales, tacos, cabrito, and enchiladas as well as quesadillas made with the two cheese varieties stated earlier. 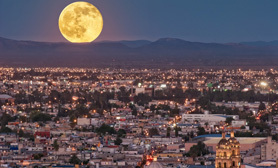 The capital city Victoria de Durango is situated in the Guadiana valley in the center of the State, Durango is also known as the “pearl of Guadiana”. Victoria de Durango is most extensive and populous city in the State, was founded as “Villa de Durango” by Francisco de Ibarra on July 8th, 1563. Walking through the historic center of Durango is like looking at an architectural book. It boasts the largest number of historic buildings in the north of the country, earning Durango a spot on the route called the “Camino Real de Tierra Adentro”, or “Royal Inland Road”, which has been declared a World Heritage Site by UNESCO. With so many unique buildings, the city of Durango has converted many mansions and palaces into fascinating museums and cultural centers, exhibiting precious antiquities, religious art, historical archives and ethnographic collections which reflect the artistry of the indigenous people who first settled in this region.